This project will take the form of an interactive public-art installation at multiple pop-up venues throughout the greater Lawrence community. 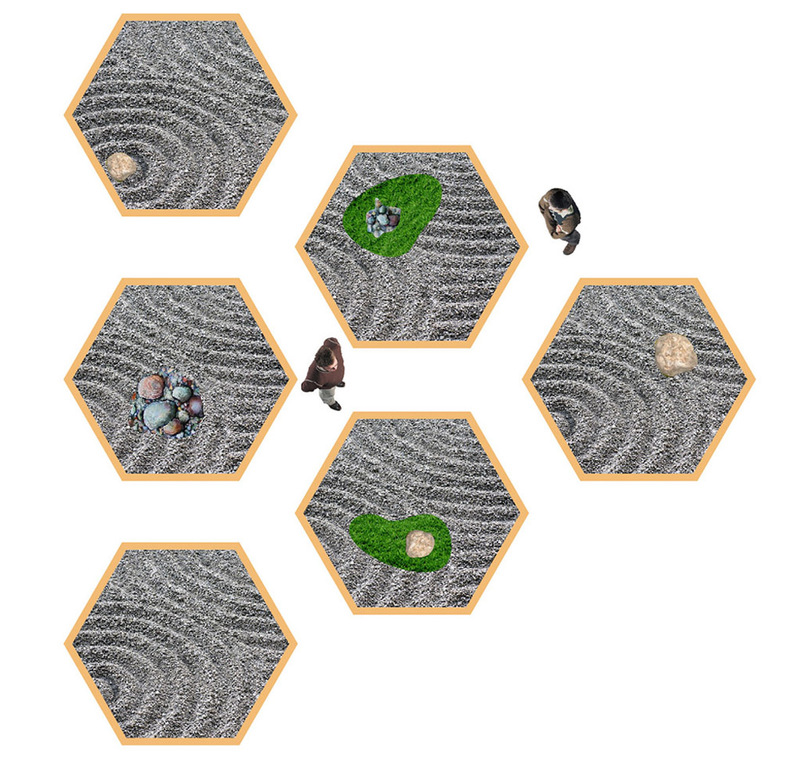 The proposal calls for the fabrication of a collapsible 8×8-foot Zen garden complete with a wooden frame, a 2-inch thick layer of pea gravel, a garden rake, and three faux landscape stones equipped with hidden cameras. Signage will warn participants of the use of video recording with the prompt, Rest Assured, You Are Under Video Surveillance. The installation will give visitors a space to “relax” under the watchful eye of constant surveillance, and time to contemplate the comfort and simultaneous invasiveness of round-the-clock surveillance. The video feeds will be broadcast to a publicly accessible website where participants can act as both the surveilled, by relaxing in the garden, and the surveillant, by accessing the site through any browser-equipped PC or smart phone. Lead artist Bryon Darby says: “This work is motivated by the duplicitous nature of surveillance in our contemporary culture. There has, perhaps, been no other time in recent history so punctuated with the distrust of cameras. At the time of writing this proposal, B&H Photo Video, one of the largest online photography retailers, had over 4000 individual items listed as “surveillance cameras” with 337 items qualifying as “hidden cameras.” These include fake alarm clocks, watches, key chains, desk lamps, pens, birdhouses, coat hooks, floral arrangements, light bulbs, smoke detectors, eye glasses, cigarette lighters, neck ties, baseball caps, jackets, backpacks, pencil sharpeners, books, teddy bears, packs of cigarettes, and yes, faux landscape stones. Rest Assured, You Are Under Video Surveillance aims to bring to the surface the duality in popular thinking about surveillance. The team plans to engage thoughtful public conversations as an adjunct to the garden – about rights, privacy and individual liberties; about compromise, the greater good, community, and commonality; and also about limits, respect, and the individual. Perhaps most importantly, they hope to expose the complexity of the issue. Aaron Long is a Ph.D. candidate in the English Department at the University of Kansas. His research focuses on mechanized transportation in late-nineteenth- and early-twentieth-century British and Irish literatures with particular interest in constructed bodies (robots, automobiles, and animals, to name a few). Special topic courses taught have included “Wings as Weapons from The Iliad to Iron Man” and “Islands in Conflict from Shakespeare to Lost”. Additionally, Long works for KU’s Center for Teaching Excellence, where he researches course design, assessment, and game theory. He holds M.A. degrees in Literature (American University) and Philosophy of Religion (Denver Seminary). Long’s role in this project is as decipherer, communicator, and community-moderator. Cotter Mitchell began an art-support career at the Spencer Museum of Art as an Exhibition Technician in 1984. Since 1989 he has managed the Common Shop for the Art and Design Departments at the University of Kansas, assisting students and faculty with all aspects of fabrication in numerous mediums. Mitchell works along side local and international artists and galleries specializing in the fabrication of public sculptures, and the packing, shipping, installation, and display of art objects. Mitchell’s role in this project is as planner and fabricator. Aaron Paden is a photographer, sociologist, and community event organizer. As a photographer he has extensive experience documenting artwork – helping artist win numerous awards and routine publishing in premier publications. As a sociologist he has an interest in teasing out our culture’s duplicity in seeking comfort, control, and security from the contrasting practices of privacy and surveillance. He has built stages, sets, movie screens for multiple community events, and has been the Director of facilities and operations for The Kansas State Fiddling and Picking Championships for 7 years. He is the current president of the East Lawrence Neighborhood Association. Paden’s role in this project is as facilitator, community-engager, documenter, and laborer.